"I saw Algeria again as it was thirty years ago"
'Más creación, más cultura' was one of the intended government objectives as stated by Chile's President Michelle Bachelet when she was elected in 2006. Bachelet is doing everything possible to put Chile's culture on the map, on a small scale in her own country, with programmes like Creando Chile en mi barrio, which started in 2007. With this initiative the government hopes to establish cultural centres in impoverished areas in forty cities with more than 50,000 inhabitants. This year the over-all culture budget was increased by 38.6%, while an additional 126% was added to this specific project. Bachelet's socialist government wants to make culture accessible to all Chileans, not just the elite. Another project being funded this year by the government is Nacidos para leer, a programme intended to bring books to children throughout the country at an early age. 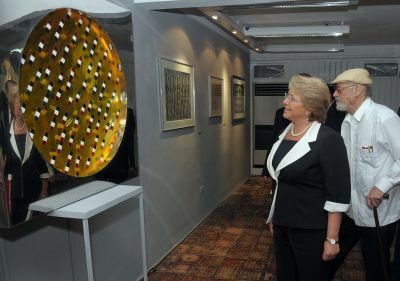 Bachelet wants to not only strengthen Chilean culture from the inside out, but also stimulate it by promoting its export. For that purpose, the president personally attended the opening of Feria del libro, the Cuban book fair at which Chile was this year's guest of honour. Her speech on that occasion recalled how cultural progress was "cruelly halted" by Pinochet's 1973 coup. Bachelet personally experienced the consequences of that dictatorship. Her father died in 1974 during imprisonment after being tortured, and Bachelet and her mother left their homeland after a brief imprisonment. Bachelet's seriousness in promoting culture is also evidenced by the important cultural delegation that will be accompanying her when she visits Queen Beatrix of the Netherlands and French President Nicolas Sarkozy in May 2009. The most striking member of that delegation is author Ariel Dorfman, whose moving play Death and the Maiden - about a woman meeting her torturer - has been staged several times in the Netherlands and was filmed by Roman Polanski. Michelle Bachelet will be visiting the Netherlands from 25 to 27 May with a cultural delegation consisting of Ariel Dorfman, Juan Gabriel Valdes - director of the new promotional agency for Chilean culture Imagen País, established under Bachelet - and Esperanza Silva, chairman of the actors guild.